This first stage was supposed to be an easy stage - it wasn't. The beginning of the stage was a neutralized start. Meaning the first 25km were led by a pace car, we were of course far enough in the back that it didn't affect us. Honestly, we were simply not fast enough to be sucked along in 40km/h speed-train. 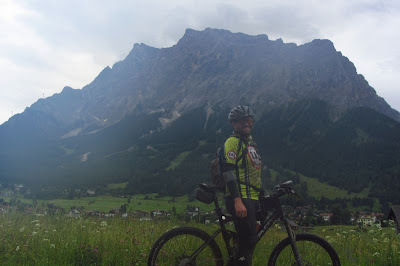 We finally got off the main road an hit some gravel road and eventually single trails along the Plansee. We hit the first traffic jam of the race along the those trails. We lost 15 important minutes!! This stage wasn't too bad though. We were having a lot of fun pushing the pace on one steep climb, which ended up taking its toll on us later in the day. Even though it was only 300m of climbing we both hammered it up. Andi said, "I never redline, others make me" - and today I was one the one to push him :). 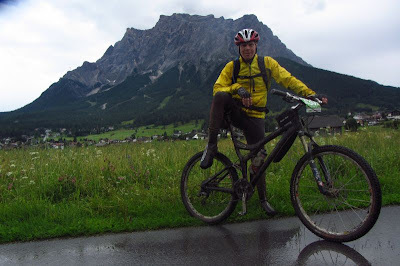 The first real climb up to the Marienbergjoch, turned out to be a first real challenge. Oh well, we enjoyed the rest of the day. It eventually stopped raining, which had started in the morning, and the sun came out. Based on my experience of the day I should probably start focusing more on downhill events. I am pretty comfortable with my downhill skills and passing people is more fun than being passed on the climbs. The pictures below show Andi and I with the tallest German mountain in the background. Yes, we were cool enough to stop and take pictures. After finishing that stage it was all about recovering for the next easy stage with ~50 miles and 11k and of climbing.